The T-34-57 is a Rank III Soviet medium tank with a battle rating of 4.0 (AB) and 4.3 (RB/SB). It was introduced during the Closed Beta Test for Ground Forces before Update 1.41. The 57mm ZiS-4 gun can prove to be formidable at its battle rating, providing a noticeable improvement in penetration power, better aerodynamics and faster fire rate than the 76mm calibre T-34's of the similar Battle Rating, with a slight sacrifice in post-penetration damage and a higher chance of ricochet on angled surfaces compared to guns of higher calibre. The tank's armaments make fighting at long and short range a boon. Operational and visual characteristics of the T-34-57 are as similar and as common to previous 76mm-armed T-34 lineage of tanks as they come, with the exception of a gun of smaller caliber and higher penetration power. 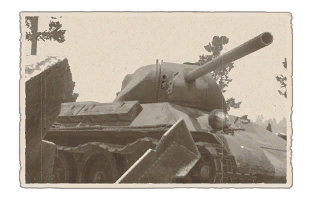 Players experienced in operating previous models of the T-34 in Rank II should have little to no difficulty in adjusting to this vehicle. Due to the similarities however, the tank inevitably inherits both its predecessors' strengths and weaknesses. It is to be noted that armour is ineffective against the occasional Rank III guns; usage of speed and agility to move quickly, to avoid enemy fire and moving cover-to-cover will prove advantageous. The T-34-57 works very well with other allied tanks (British and American) that it is often paired with in RB and SB. It retains high mobility and an effective main gun, allowing it to quickly reach capture points or tactical firing positions, usually following M18s and other T-34 tanks, which are often first at the scene. The T-34-57 can be played in a variety of roles. The gun is very accurate and has high penetration, making it a great sniper. The tank is fast and maneuverable, making it a good flanker. It can also brawl due to its fast turret rotation and great reload speed. However, don't expect to take many hits. At this tier, the T-34's armour will not stand up to enemy guns, even when angled. The best thing to do is keep to the flanks or just behind the battle line and take out enemy tanks at range and from cover. In lower tier battles, the T-34 will be in its element, picking off common foes like Pz. IVs and Shermans with ease at long range. The 57mm gun performs very well at long range against these tanks, so don't be afraid to hold back. However, you are just as effective pushing towards capture points. At lower tiers your armour is still quite effective, so angling can make you very difficult to penetrate. Just be aware that your turret armour is quite weak. In higher tiers (up to 5.3), you will be less effective. There are many tanks that you will not be able to penetrate from the front. The Sherman Jumbo and Churchill Mk VII are notable opponents. Their armour is very thick at the front bar some small weak spots (machine gun ports). Luckily you will be working with tanks like the T-34-85, SU-85 and even the IS-1, which can destroy the Jumbo under 500m. Leave the front line combat to them. You can flank and hit your enemies from the side. It is the only way for you to be fully effective. At top tier, the 57mm will have gone from being a highly effective precision weapon to a relatively hit and miss weapon. Some targets you can penetrate, others you will need to retreat from. Pretty much any tank can be penetrated by the 57mm gun at this tier, but there are a few enemies worth noting. M4A3E2 Jumbo - This tank is the bane of everybody's life at this BR. 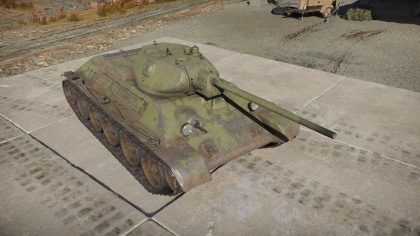 It's turret in almost impossible to penetrate without APCR (which the T-34-57 does not have), its hull is VERY bouncy, and its gun can easily penetrate your armour. Avoid approaching from the front and flank if possible. If you find yourself backed into a corner, you can try and aim for the machine gun port in the hull. The explosive power of the 57mm isn't great, but penetrating this point means that you can at least cripple the jumbo and make your escape. Panzer IV variants with KwK 40 L/43/48 75mm gun - These tanks are common at this tier and they can easily take you out with their powerful 75mm guns. However, they are easy to take out if you get the jump on them. Your high penetration 57mm gun can slice through their armour at long range. 8,8 cm Flak 37 Sfl.- The flak truck can destroy you at seriously long range, whilst its thin armour makes it very hard to effectively damage. Your rounds may simply pass straight through and not cause any damage. The best way to take one out is by aiming for the large ammo box at the back of the vehicle, which will explode when hit. Other T-34 tanks (except 1940 variant) - Many of the T-34 variants (1941, 1942, T-34E STZ, etc. ), including the T-34-57, can comfortably penetrate each others' armour at reasonable distances. Unless you are playing SB, you are likely to come up against other T-34 variants. Since you play this tank, it's easier to know your strengths and weaknesses. Make sure the hostile T-34 is not looking your way, then fire into the main hull or the turret to knock out the crew or blow up an ammo rack. Retreat to a safe distance before re-engaging. If direct confrontation is inevitable, angle your hull and fire into the front of the hostile tank to at least disable them and give you time to re-position, finish destroying the enemy, or escape. As far back as the summer of 1940, an attempt to improve the anti-tank gun inventory in Soviet service was undertaken. This was due to only having massive stocks of underpowered 45 mm anti-tank cannons available, which were becoming obsolete with the newer armour being used by the Soviet Union's adversaries. When the request for an improved anti-tank cannon was sent out, a design bureau headed by V. G. Grabin was already underway under the name 57 mm ZiS-2 anti-tank gun. The 57 mm was a very powerful anti-tank weapon due to its high penetration value with the high-velocity shells. The APCBC round available under the name BR-271 was able to penetrate 93 mm of armour when fired 100 meters away at a meet angle of 60 degrees. The first of the prototypes were created in the September of 1940, and it as later approved for production on June 1, 1941. However, this was stopped on December 1 due to beliefs that the high-velocity 57 mm shells would simply penetrate straight through tanks without causing damage or that it was a high-cost weapon. The production lines were then switched to produce the 76.2 mm ZiS-3 guns. It was during its production life before being cancelled that the 57 mm gun was attached onto a T-34 as a main armament in April 1941. However, the trials on this armament showed a lack of accuracy and short barrel life. Then in July, an improved variant of the 57 mm called the ZiS-4 was installed onto the T-34 and tested again. This variant turned out to be successful and the gun was recommended for installation on certain T-34 units, despite the high cost of the ZiS-4. The T-34 with the 57 mm were redesignated the T-34-57 and had the purpose of being "tank-hunters" due to the higher penetration value of the 57 mm compared to the default T-34 76.2 mm armament. The 57 mm ZiS-4 gun was produced at the Artillery Factory #92 and were mounted on various T-34s. However, the stop of all 57 mm production on December 1941 also stopped the 57 mm ZiS-4 production, thus halting the T-34-57 production with only 133 ZiS-4 guns made in the production life. The 57 mm guns were revived in 1943 due to urgent needs for much better guns against the newer German tanks. The current 76.2 mm F-34 gun on the normal T-34s were unable to defeat the newer German Tiger I and Panther tanks. In a desperate attempt to upgrade the T-34 to compete against these tanks, the 57 mm was reinstated for production and began being issued in May 1943, these models being the T-34-57 mod. 1943 due to the upgraded armament. The ZiS-4 was upgraded to the ZiS-4M with simplified parts and standardization in parts from current existing artillery pieces such as the F-34 and the ZiS-2. These T-34-57s saw further action against the Axis until they were retired. In total, about less than 324 T-34-57s were made during its production life in 1941 and 1943. The T-34-57 made in 1941 saw action during the Battle of Moscow in small quantities. The 21st Tank Brigade has 10 of such tanks in their units and were deployed on October 14. Though the brigade were able to cause massive damage to the German lines around Kalinin, but ended with all of the T-34-57 destroyed by November 25. Other units using the T-34-57 were the 8th Tank Brigade in October 19. Afterwards came the deactivation of the 57 mm from the production line in the end of 1941, but the T-34-57s were revitalized again in 1943 to counter the newer German tanks. These tanks were used as "tank-hunters" and formed "Special Tank Company 100" with three T-34-57 in its first platoon to deal with German tanks. Despite their role, the company would only meet German tanks once in its life, and the first platoon was never used. Thus, the T-34-57 was never really able to prove their efficiency against active German tanks, though the unit would praise the gun's performance in practices against pillboxes, bunkers, and knocked out German tanks. All the T-34-57s were disbanded with the retirement of the 57 mm as a tank gun. This was due to its small HE shell available that made it a inadequate tank armament against softer targets, and also the introduction of the much bigger and better 85 mm tank gun on the newer T-34-85.